I’m pretty sure that everyone will think I’m out of my mind for posting this , however I think it’s an important thing to be doing at this time of year. That is, getting ready for next season. With Christmas and the New Year right around the corner I have already taken out all of my flies, positioned them by pattern and size and then made a list of all the ones I need to tie to fill in the holes. Nothing worse than to realize just before a trip that you don’t have all of the flies you need. I simply take each pattern, make a note of the sizes I need and then keep the list by my fly tying bench where I can pick do up what I need. Once I’ve got the list done I will also check my fly tying supplies and make a note of anything I need so that I can make sure when I go to the tackle shop I get exactly what I need for what I want to tie. 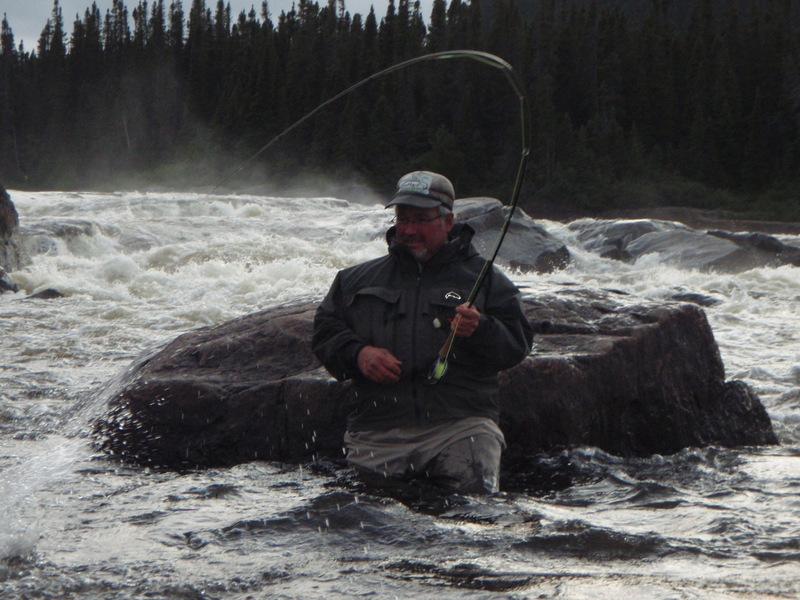 Once I’m done with the flies and material I check over my reels and lines. I use some pretty old Beaudex reels that were made in the 50’s and 60’s and they are in a constant state of needing repair. I always get asked why I am using a pretty much antique reel with almost no drag system and my answer quite simply is that I like the “screech” it makes when a salmon tears off down the river. Do they cause me a few problems, you bet. More than once in a season I will end up with a major birds nest of a backlash, but it’s the sound I like to hear. Once my reels are checked over I will take a look to see what kind of shape my lines ar in and see if any are in need of replacement. No messing around here. If the line is worn and cracked I don’t give it much thought and get a replacement on the reel so that I will be ready in the spring. Next I check over my roads, waders, wading jacket and accessories, making notes as I go and by the New Year I will have all lists made, some of the new flies tied and will be getting totally jazzed for the upcoming season. After all, once we get to January 1, it will only be 151 “Big Sleeps” until the 1st of June and the Bay St. George Rivers open in Newfoundland. The Undertaker, much like the Blue Charm is one of my go to flies. It has been modified from the original and I am sure that lots of fishermen have adapted their own vrsion. This is how I like to fish it and it definitely goes on just after the Blue Charm. I prefer to tie this on up turned eye hooks as most of the time I will be fishing this fly in Newfoundland or Labrador and will be ” hitching” it. For 23 years I have gone out with Beryle Levy on the opening two days of the lobster season. This year we set traps on the 28th and were allowed to look them on the 29th. It was an ugly cold day with the wind blowing 25 – 30 from the northeast. Photos below are of Len, Levy’s other helper, holding a 5 or 6 pound lobster and the photo below that is a trap that had over 15 lobsters in it. The catch was good and I’m pretty sure that this was the first time that we never had a trap that didn’t have a lobster in it. I was so cold when I got home that it took about two hours for me to warm up. For the past few years I have been making phesant and rabbit pies for Christmas. 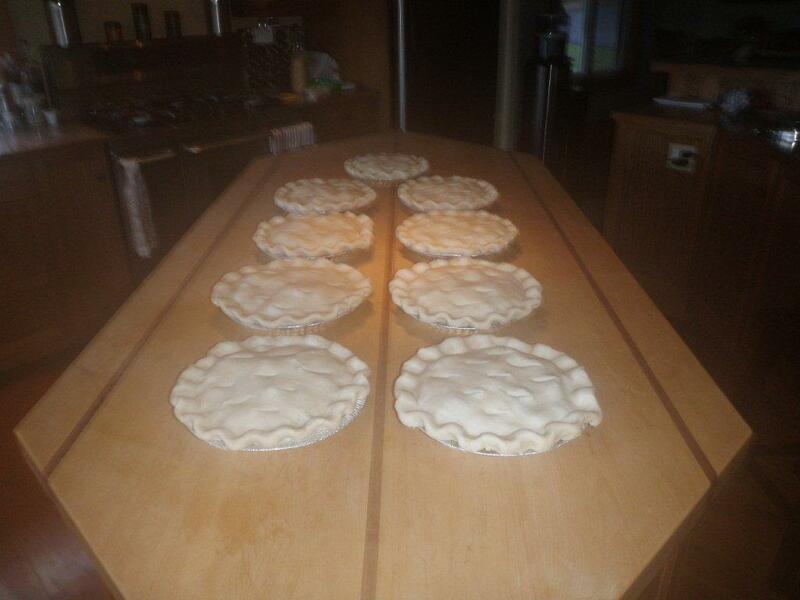 It started out with one or two pies for home and has eveolved into a small pie making factory. This year I made 10 pies and have people pretty much fighting to either get on or stay on the pie list. 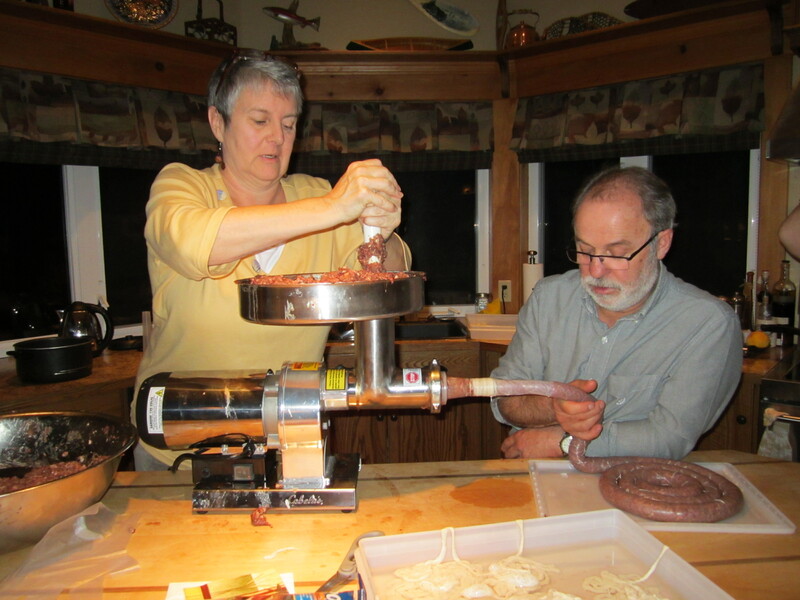 With the season now closed, we decided to try our hand at making sausages. I had a bunch of geese in the freezer and thought they would make pretty good sausages. 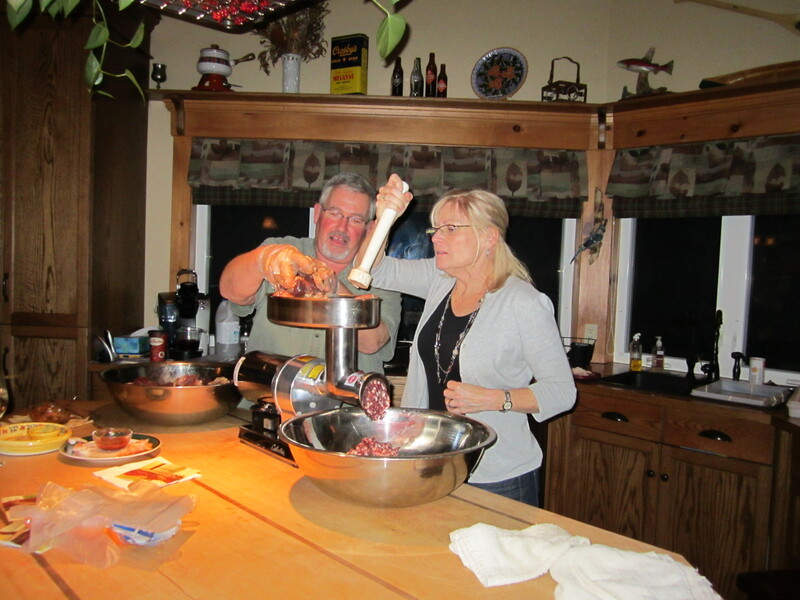 I borrowed a grinder and sausage stuffer from Lloyd Maclellan, got a recipe and some spices from Master Butcher Charly Stutzel, watched some You Tube videos and invited our good friends Paul and Gil over for what turned out to be a hoot. None of us had any real idea of what we were doing and at first the ladies were a little apprehensive about getting their hands in the goose. In the end we turned out some awesome sausages and had a lot of laughs. Our season is now over and we salmon junkies, in fact all fishing junkies, will now have to survive the winter recalling memories of past seasons, a few sessions at the vice and lots of time spent with our fishing friends. As soon as the New Year comes I will begin a countdown of the big sleeps left until opening day and then start getting my gear ready. I am an addict and clearly recognize it and although at this time and after 41 sesons it doesn’t appear to be getting any worse, it sure isn’t getting any better. Thanks to my wife Ann for her patience with this problem. In a few days , Novemeber 11th, we will have been married 34 years and never once has she asked me not to go to the river and there were lots of times she could have and probably should have. I am extremely lucky to have her for mor reasons than just this. 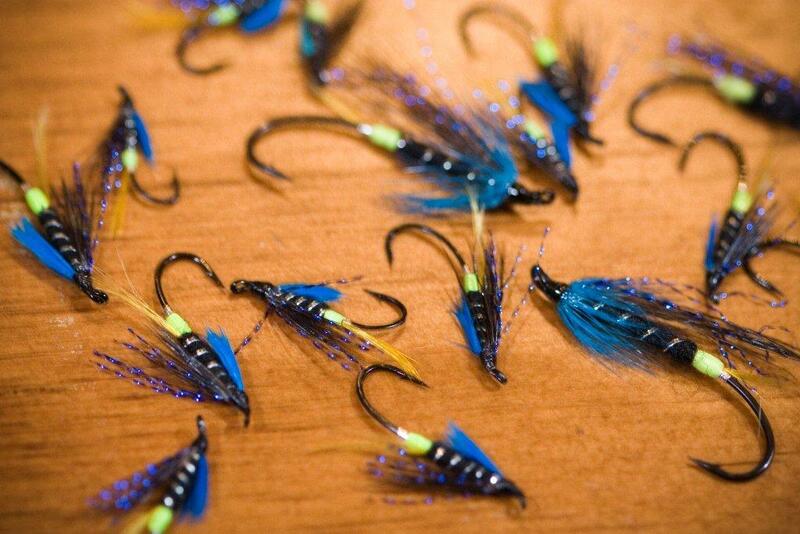 Over the past 41 years of fishing for Atlantic salmon, the Blue Charm has been my go to fly on many occasions. It has gone through a number of transitions before I arrived at the pattern that I use now. As pictured, this is the way I tie my Blue Charms today. Hook – Your favorite, either up eye or down eye. I like to tie this pattern on up eye partridge Single Wilson hooks. I like the size of the gap compared to the length of the shank and also I am doing a lot of my fishing in Newfoundland and Labrador where I like to fish the “hitch”. The “hitch” is , in my mind, best fished on an up eye hook.